The wind and the events shape our life. I ‘m quite late in preparing Christmas cookies this year and simplified my actions making variations on sugar cookies. For this recipe I added the baking powder for more volume! Today I will present you my Christmas trees I will use a table decoration. The quantity of dough you need depends on the size of the tree you will make. This post will be a simple input or suggestion for your own creation. This makes a wonderful gift! Cookie cutters in star shapes as much size as you get! Roll out the dough and chill before cutting. Cut out the stars beginning from the bigger size. I made two stars with each size, but if you don’t have many sizes you can cut out more. In the meantime prepare your green glaze. I used one cup of powdered sugar, added to color and the liquid (I used rum) stirred and added more until I the glaze had a thick consistence but was not too liquid. Prepare the support: I made a hole on the base of a tuna can and inserted the skewer. For stabilization I inserted a cork thong in the inner part and fixed it with hot glue. In 10 minutes in was done. I covered the base with aluminum foil before inserting the stars. Paint the first stars with a brush or simply with the fingers. The center of the star is not relevant your need to cover the borders of the cookies as well as possible with the glaze. Insert the first star into the skewer. Now paint the second one and insert it over the first star. They should look staggered! Continue in the same way. When you are on the top cut the exceeded skew (a scissor was fine for me) letting 1 cm on the top. 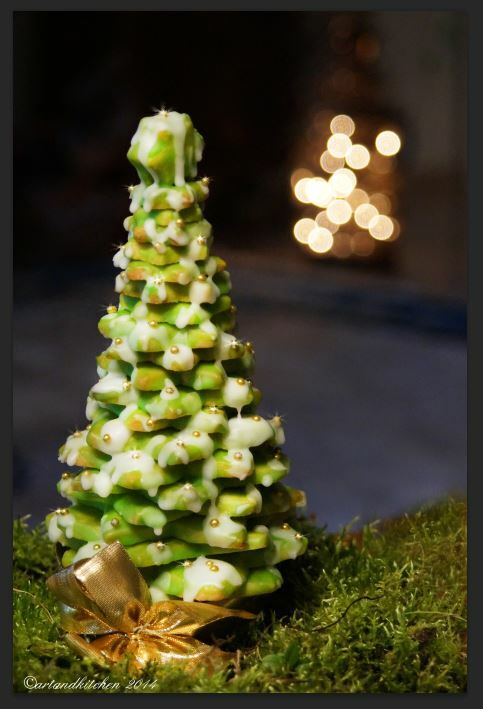 Use two small stars placed vertically to cover the skewer top and make the tree pretty. When the green glaze is dry, prepare the white one in the same way, should not be too thin! Now let drop the white glaze using a small spoon beginning from the top. Quickly add the sugar pearls before the glaze is too hard. Let dry and finish to decorate the base eventually with a cute ribbon. And this was the original!